1. 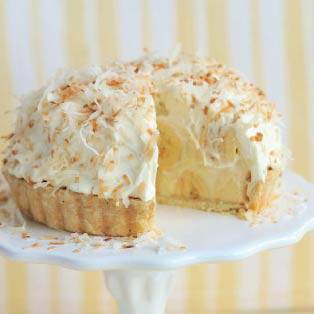 Make the coconut pastry cream: In a saucepan, bring coconut cream and milk to a boil. 2 In a separate bowl, whisk together yolks, sugar, cornstarch, and vanilla extract. 3 Pour half of the boiling milk over the yolk mixture. Whisk well then return the mixture to saucepan. 4 Continuously whisk the mixture until thickened then add butter. 5 Transfer mixture to a bowl and place a sheet of plastic wrap over the surface. Allow to cool to room temperature then chill in the refrigerator until ready to use. 6 Make the flaky pie pastry: In a large bowl, combine flour and salt and stir to mix. Scatter butter and shortening over the flour mixture. Using a fork or pastry blender, toss flour to coat then cut in butter and shortening until the mixture forms coarse crumbs the size of large peas. 7 Drizzle ice water over the mixture and toss with the pastry blender until the dough is evenly moist and begins to come together in a mass but does not form into a ball. 8 Transfer the dough to a work surface. Form dough into a 6-inch disk. Wrap disk tightly in plastic wrap and refrigerate until well chilled, about 1 hour or overnight. 10 Roll out the disk between 2 sheets of parchment paper (or wax paper) to a circle 2 inches larger in diameter than the tart pan. 11 Press dough into the tart pan. Use your hands or rolling pin to level the dough along the edges of the pan. 12 Place aluminum foil over the dough and gently mold it to the dough in the pan. Add pie weights (dried beans work well). Bake for 20 minutes. Remove from oven and let cool. 13 Assemble the pie: Place a layer of bananas on the bottom of the tart shell. Pour half the pastry cream over the tart shell then top with another layer of sliced bananas. Pour remaining pastry cream and level using a spatula. Refrigerate for at least 1 hour. 14 To finish off the pie, pour heavy cream into an electric mixer and whip on high speed. Gradually add confectioners’ sugar and whip to stiff peaks. Set aside. Time-saving tip: If you don’t have time to make pie crust from scratch, make a graham cracker crust instead by mixing together 10 tablespoons graham cracker crumbs, 1/4 cup butter, and 1/4 cup granulated sugar in a bowl.